Both in Europe and in North America the majority of agricultural machinery manufacturers supply speed harrows to adapt to the new tillage trends. With speed harrows, each disc is housed in a hub that is fastened to the frame by separate tines. This system has different advantages in relation to the traditional harrow discs. Firstly, the speed harrows adapt very well to uneven ground seeing as each disc works independently from the rest. Furthermore the average working speed is faster than in the traditional disc harrows and if a disc breaks it is easier and faster to change in the speed harrows. The speed harrows are lighter machines than the traditional disc harrows. This means that less power is required from the tractor when this farm machinery is used. The work done is shallower, about 5.15 cm deep. The discs that should be used on the speed harrows are low concavity discs with a flat centre, of between 18” and 24” in diameter. 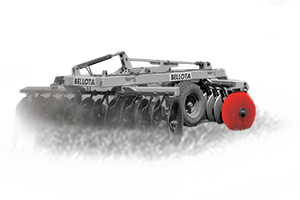 Bellota has a wide range of agricultural spare parts for speed harrows. As well as the discs with different concavities, there are three different brackets available, all of them with a profile of 90x14. The model 2512 BRG A is mounted on the frame by means of a clamp. This Bellota model can be mounted on a frame of 60x60 and 70x70. The 2512 BRG A CA1 is fastened on to the bottom side of the frame using two bolts size 14. The model 2512 BRG B on the other hand is mounted on the front part of the frame using two bolts size 16. The three types of tine brackets can be fitted on with the hub mount at an angle of 90º or 19º depending on the work that is going to be done. Bellota sells the hubs separately in boxes that come with their corresponding kit of screws and bolts to fasten the disc onto the hub. Clamp for 60x60 chasis: 125126060 (M14). Clamp for 70x70 chasis: 125127070 (M14). 12512KIT7070: Robust and heat treated clamp. It stops the tine moving sideways in the frame. Fixes to frame with 2 bolts of 14 mm metrics and 60 mm of distance between the two holes. Fixes to frame with 2 bolts of 16 metrics and 50 mm of distance between the two holes. For BAA or HUB type bushes. Also can be tailor-made according to the requerement of each client. We recommend to mount with flat center blades, models 1960, 1961 and 1965.